We have spent the past few days in total preparation mode. I feel like we should be relaxing a bit more, but I know that if I don't stay busy, my mind will start racing with worries... which I definitely don't want. I think I was on my feet for 6-7 hours yesterday and I was definitely feeling it ... my back was so stiff and sore by bed time. I will NOT miss all these aches and pains! Anyway, the nursery is almost there. We just need to hang up the prints we have ... hopefully, we can do that tomorrow. 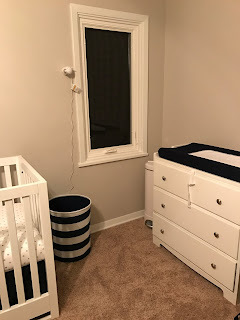 (We'll still need to buy a dresser at some point, but that is obviously not going to happen in time!). Overall, I'm trying to accept that the house will not be perfect and to be content with whatever we get done. Mike made and painted the book ledges. Love them! 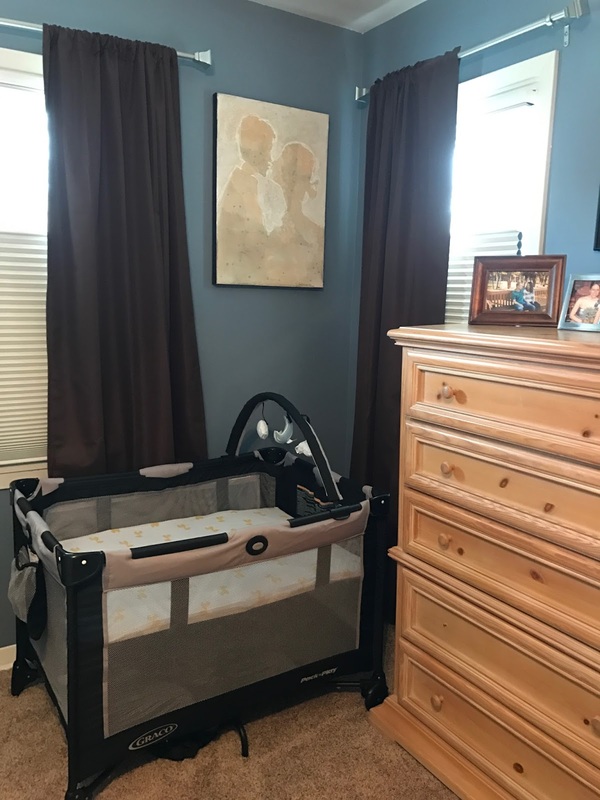 Pack n' Play bassinet is ready to go! We also had our final ultrasound today. They checked that the umbilical vein varix was still stable (it is!) and also did a growth assessment. Baby is measuring at 34 weeks 1 day (I'm 35 weeks 6 days) and his estimated weight is 4 lbs 15 oz. 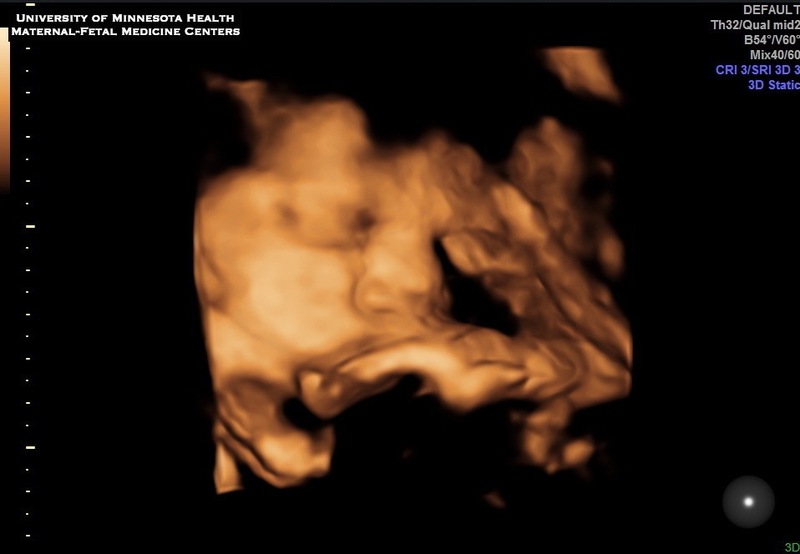 He was moving a lot during the ultrasound and the tech repeatedly pointed out all the practice breaths he was taking. So he's doing great! 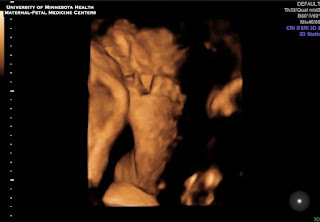 I asked the doctor if he could just be a small baby, and he said that based on what they are seeing, that appears to be the case. We got Blizzards on the way home to celebrate and to try to pack that extra ounce on baby and push him over 5 lbs ;) AND I actually have a couple pictures to share (we hadn't gotten any for several weeks). A peek at his face! Yay!! You're ready to go! 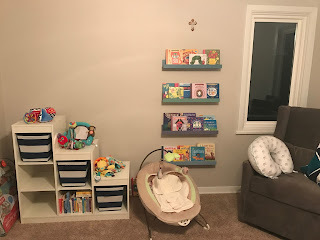 The nursery looks so sweet! I love that you have the changing table from your own nursery and Mike built the ledges!! You are going to do great!! Please let me know when baby arrives and you have a moment to take a breath and relish in that new baby smell!